I decided to back the Kickstarter because I had hopes that it would truly be a different style of MMO... I liked many of the concepts that they described for making it different from World of Warcraft. I especially liked the idea of it being a bit of more dynamic world, where you could ignore certain mobs, but at a risk of having them evolve in intervening time into a more dangerous threat. I also was not impressed with the package of PDFs that were given out as a stretch goal -- so many of them turned out to be freebies Quick starts or samples that anyone can get without having to invest any money in the first place.that I was so underwhelmed. Heck, I think most of the ones that had value, I had already received from backing other Kickstarters, so they weren't of any value to me... so I was glad that I didn't let it's existence influence me at all. So when I received my email notifying of the shake up and changes, I can't say that I was surprised. I would hate to see the game go belly up since there are so many other people that seem to enjoy it and want to keep it going. I do not wish ill upon Goblinworks at all, but I just cannot bring myself to feel anything in either direction regarding how things have evolved. I did not back (I generally stay away from video game Kickstarters because they are even less stable on average than other media), but I did have hopes that they would be able to get a working game out of a beta state. I hope they find a buyer, but MMOs are at a bit of a saturation point, especially if they don't bring something new and unique to the genre. I hope for the best for the Goblinworks staff and fans. 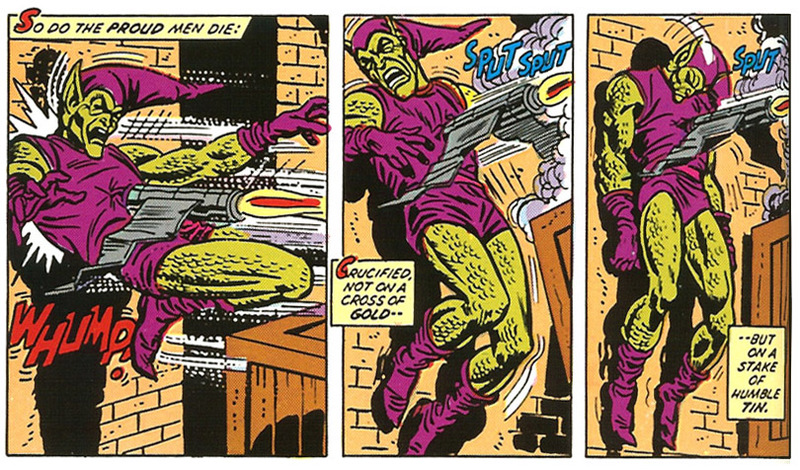 Norman Osborn is the Green Goblin in that sequence. Far as I know, he died in the '70s and never came back. I remember this sounded far too ambitious, but Paizo actually had me convinced this might work. Didn't really follow it, though, or put any money toward it. Sorry to everyone involved that it didn't work out. My experience was rough. I kicked in at the level to form one of the early guilds, only to have everyone who was to join me flake out. Then, I saw the book I was to get in the local game store before I got mine. Then I learned the actual game had very little to do with Pathfinder. I logged in once and goofed around for a couple of hours before I quit and uninstalled. Is this some kind of video game? I don't even understand what they are selling. It's a multiplayer RPG video game. It's supposed to offer a different sort of experience than say, World of Warcraft.